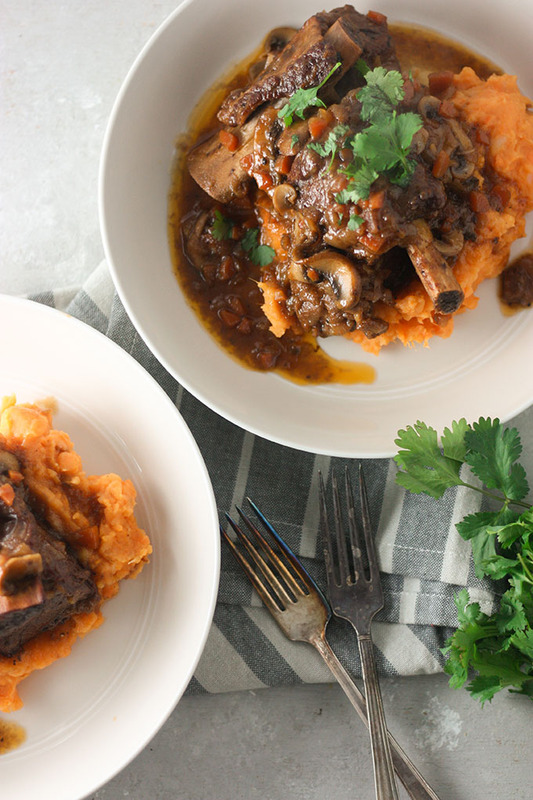 These beef bourbon ribs are a perfect meal for a date night in or a cozy winter main meal! Enough to make for a dinner for four, or just the two of you with a little leftover! Sticky bourbon and brown sugar ribs, slow cooked to perfection and served with mash potato or sweet potato. Winter comfort food at its best. Thanks to Eastside Distilling for providing me with the product for this post! As always, my opinions are my own! Thank you for supporting the brands that make THCK possible! OMG these ribs. They are the shizz! I have had a thing for ribs lately, maybe it’s a combination of the cold weather or the fact that I’ve decided to branch out and make you guys way more main meals this year? I dunno, but I’m loving making these main meals for ya! Adam and I actually make these for our first second wedding anniversary the other night! Ha, I know this sounds weird, but long story short, we got married a year before our actual wedding (visa/work/moving to the US purposes) and while we’ve been technically married for two years, last weekend was our first wedding anniversary on the actual day we had the big party and ceremony! Anyways, on our wedding day, we wanted to do something a little different that we could continue to do every anniversary and came up with the idea of having a recipe box. As both of us love cooking, we thought that each anniversary we would make a new meal together, and sit down and celebrate. We would write the recipe on the card, and put it in our little box as something to cherish our anniversaries together! On our first wedding anniversary, we made this amazing lamb ragu and that was the first recipe we put in our box on our wedding day back in Australia! This year it’s this bourbon beef ribs recipe! We thought it was such a beautiful idea and I love the idea of having this box that we can pass down to our kids and future generations! These beef bourbon ribs are seriously good. Think, slow cooked beef short ribs, in a bourbon/stock/ketchup based sauce, with just a hint of brown sugar and a few other bits and pieces thrown in there to jazz it up a touch! The flavour of the bourbon really comes through and it’s perfect to serve as a date night dinner idea, or if you’re entertaining for a few other people. This is one of those ‘leave and forget’ meals (which I love, for obvious reasons!) but do keep checking every so often to see what your liquid levels are doing. If it looks dry, try adding just a touch more stock. The consistency should be not as thick as a gravy, but not watery. You should be able to use the mash potato to mop up the juices easily at the end. 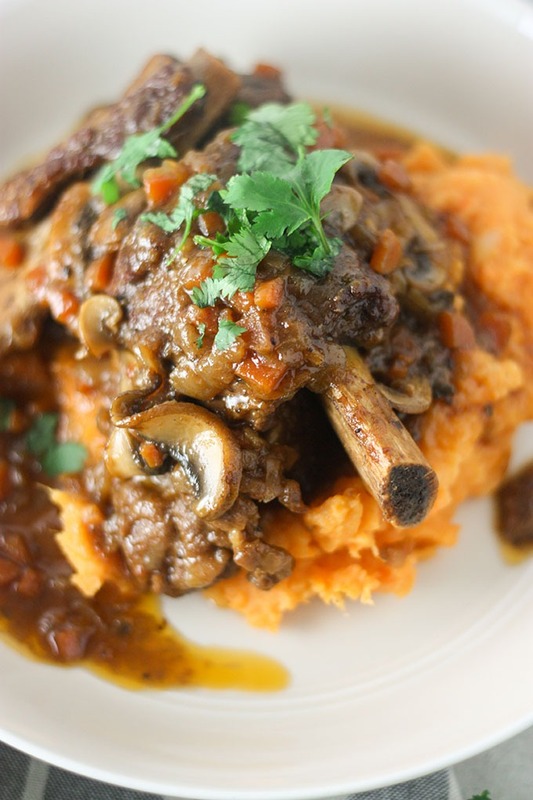 We served ours with a potato/sweet potato mash combo (I ran out of regular potatoes), and probably would have added some green beans, had I not taken about 4 recipes shoots that weekend and wasn’t completely over being in the kitchen to remember basic ideas! 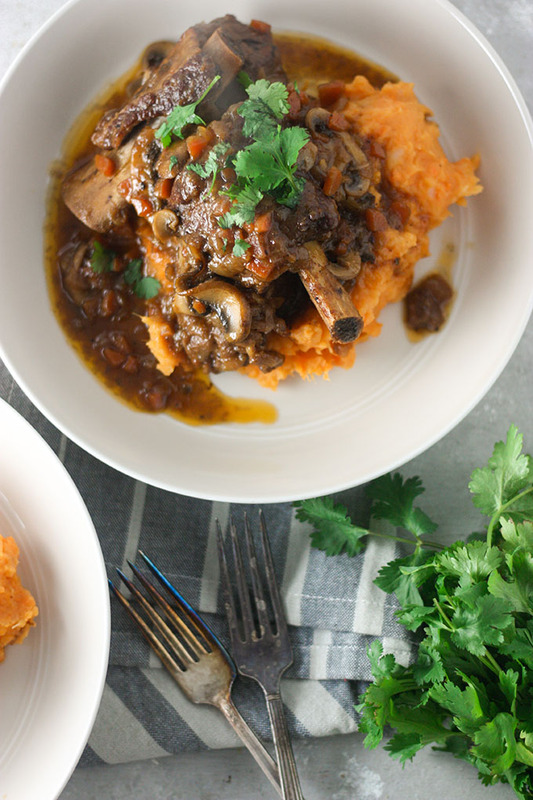 So if you’re looking to fancify your date night, and want a really easy (hello leave and forget meals…just don’t forget for too long) this recipe is 100% for you! And if you’re a bourbon fan, this will be even better! Not a bourbon fan, haven’t tried but I reckon you could sub bourbon for red wine and it would still taste awesome! 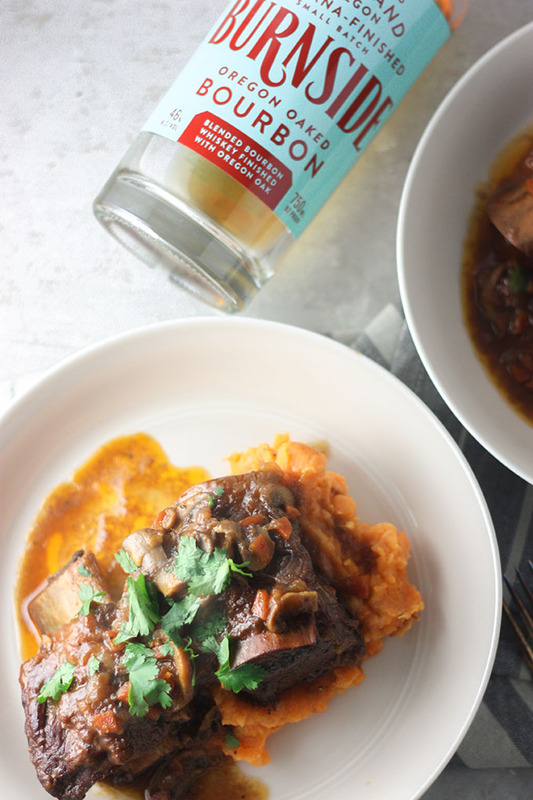 These beef bourbon ribs are the perfect dish for a date night in, or to make for your friends on a wintery night! Easy, cook and leave and so flavourful! Place ribs, flour and salt and pepper in a bag. Tie bag and shake until ribs are covered in flour. Remove and lightly slap to dust off extra flour. Heat a large fry pan or crock pot on a stove over medium to high heat. Add ribs, browning for about 30 seconds on each side. Remove. Add onion and carrot and cook for 5-10 minutes or until onion is starting to get soft. Add bourbon and beef stock and deglaze the pan. Use a wooden spoon to scrape the juices off the bottom of the pan for enhanced flavour. Add Worcestershire sauce, ketchup, brown sugar,cinnamon stick and mustard to stock and bourbon and still until combined. Add ribs back to crockpot and place in oven. Bake 2.5 to 3 hours, REMOVE CINNAMON STICK AFTER 1 HOUR. Ribs should be falling off the bone, and sauce should be slightly thickened. I LOVE that recipe box idea! That’s so much fun and will be so amazing to look back on. 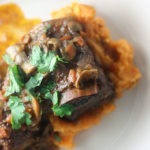 I love the sound of these short ribs too; I love the sound of most things with bourbon in the name :). Have a great week, Georgie! Your recipe box idea is ADORABLE. I wish I had done that, haha would it be weird to start 4 years in?! 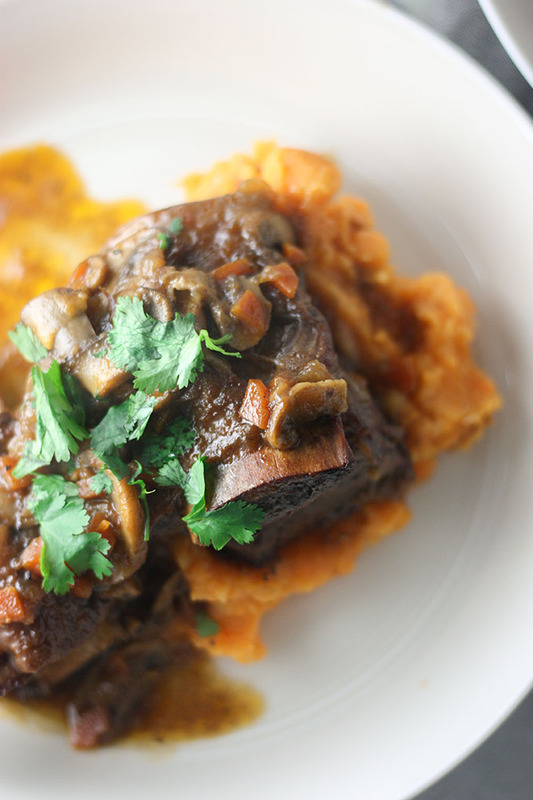 I have been wanting to make short ribs for a while now – this looks like a great place to start! Cheers, Georgie! totally do it! we were really happy we thought of it! we even made the box ourselves. Most brides get pampered the days leading up to their weddings getting their hair and nails done. Not me, I was sanding a bloody box with an electric sander!